Exuberant ctags is a pretty nifty utility for source code browsing. Especially since it integrates so well with vim. Also exuberant ctags can understand many languages (41 as per the official website). So this is relevant not only for C/C++ or Python but for all 41 languages supported (and future ones too). In this post, we explore yet another popular plugin using exuberant ctags – TagList. TagList is capable of showing a list of functions/global variables/class/struct towards one side of the vim. This is similar to some IDEs or event editors like Notepad++. This makes browsing and navigation pretty easy. Our aim will be to be able to navigate current file using TagList window and to always display current function name in the status line. TagList will work only with exuberant ctags and not with any other ctags (specifically GNU ctags). Install exuberant ctags if required. Also ensure that ctags command should actually invoke exuberant ctags. Install TagList plugin (see elaborate steps in the link). Typically vim plugins are installed by simply copying to $HOME/.vim/plugin directory. If any documentation is there, copy that to $HOME/.vim/doc and re-index vim help by giving “:helptags $HOME/.vim/doc” command in vim. Now we need to customize the TagList plugin options to get what we want. Notice the call to Tlist_Get_Tagname_By_Line() within the statuline. This is what displays the current function name (actually tag which can be class name or struct name or any tag) in the status line. With the above settings, pressing F6 will show the prototype of current function at the bottom. Pressing F5 will open up the TagList window which will show the list of functions/classes/structs/define etc. The focus is automatically switched to the list window and we can quickly jump to the function/class/struct definition we want to. Upon selecting an entry, the list window is automatically closed.shrink the window back to default size. Now with the full prototype display, it is not very easy to read the actual function name. TagList has a zoom feature to overcome this. Press “x” and the TagList window will enlarge, occupying almost the complete vim screen. Selection of an entry or pressing F5 again will close the window. Pressing x again will shrink the window back to default size. TagList generates its own tags file and does not require the user to provide a tags file. This file is generated every time we switch to a buffer. The tags file is created somewhere in /tmp/ folder. TagList cannot work with a user generated tags file. I recently stumbled upon this very interesting vim plugin – OmniCppComplete. It promised to solve one of the problems that has been nagging me. While editing C/C++ code in vim, I have always wished if it could behave like Visual Studio and show structure/class members when we give object. or object->. I wanted to try it out right away. But now comes the problem. It works only on vim 7 and above. 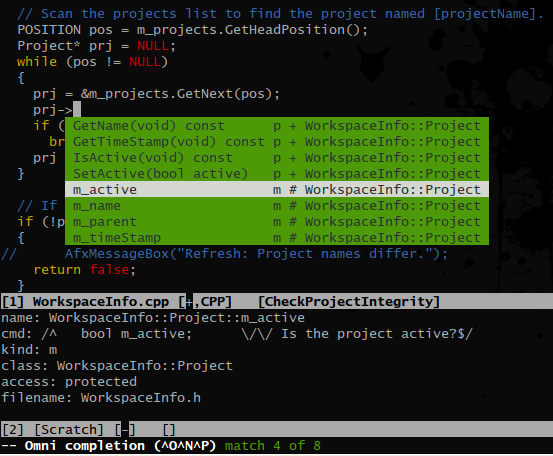 It seems vim 7 onwards, OmniComplete feature is added which allows such stuff. At my workplace, the Debian server where I write code, has vim 6. Tough luck. Plus, I share the server with another 12 users, and do not have root powers. So next option is to build gvim from source. It wasn’t as easy, so this post explains the step I took to get it working. Before we begin, a brief introduction about building stuff from source in Linux. Linux being open source, most software for Linux is open source too. That means you have full access to the source code. A bit of googling should get you what you are looking for. Traditionally, make is the utility used to build software for Unix like (and hence Linux) OSes. Linux has its own version of make called GNU make. It should be already installed on you Linux distro. Make depends upon a makefiles which describe what need to be done to build source code. To take care of the variations in Linux distros, GNU came up with Autoconf and Automake which can generate makefiles based upon your particular Linux distro. Typically there will be an executable file “configure” which tells Autoconf/Automake how to generate make files. Now if you have root permissions, you can follow the above steps. But there are times when you don’t have root permissions, or you do not want to install the binaries in the usual location, we can do this easily while invoking configure. Almost all configure scripts will take “–prefix” as an option. Here you can specify an alternate path where the binaries should be installed to when make install is given. While compiling, I ran into some issues where configure picked my architecture to be 64 bit. But I wanted a 32 bit application. So I gave “–build” and “–host” options as i386-linux to specify a 32 bit compilation. pkg-config is a neat utility that can help autoconf in finding the path of the required version of dependent packages. pkg-config will search the path in the same order specified by the environment variable PKG_CONFIG_PATH. Now we are all set. Let’s begin. The latest version of gvim is 7.3 when I am writing this blog. But I got gvim setup a couple of weeks back, so still have 7.2. There is no separate code for gvim. The code for vim has the code for gvim as well. Gvim depends upon some graphical toolkit like GTK+ (GTK 1.2 from Gnome), GTK2 (current latest GTK from Gnome), Motif (from IBM’s CDE), Athena (from MIT) etc. Wait a minute. Configure could not find any graphical front ends, so skipping gvim. Bad :(. We want to get gvim 7.2 and vim 7.2 is not enough. Typical Linux distributions rarely contain the “devel” packages required for compiling dependent package. Vim could not find the header files of GTK+/GTK2/Motif/Athena (usually found in “devel” package) required to build gvim. Since we do not have root powers, we cannot just do apt-get install. Well this is not as easy as it sounds. GTK has its own dependencies. I went through the compilation of each source package to list down all the dependencies. Here is the compiled list. cairo-1.8.10 Graphics library with PS/PDF like APIs required by Pango. Since I also use gvim for some coding in Python, I also got Python source code so that gvim was compiled with Python support (+python). Notice that we used ‘j’ switch for tar.bz2 archives and ‘z’ switch for tar.gz archives. Ta-da. Gvim is ready. Well almost. If you try to run gvim it will throw this error. Well this is because gvim could not find the shared libraries it requires to run. They are in $PREFIX/lib, but we have to tell that to bash. We do this by setting the LD_LIBRARY_PATH environment variable.